Sage Business Systems can evaluate your business needs and incorporate them into a secure, logical solution that you and your company can afford. We are Microsoft Certified Professional System Engineers serving the Tri-State area. If your business is in the market for custom software to include database, desktop or server driven applications, Sage delivers. Since 1987, Sage Business Systems has specialized in the design, installation and training of custom software solutions for businesses of all sizes. Sage Business Systems can help you implement computer applications that will effectively increase productivity and your company's bottom line. Speed up productivity... Share costly resources among many users... When your business is ready to improve productivity with a computer network, we can help. Sage develops an individual, "customer-defined" approach to each networking challenge. Whether you are incorporating a shared multifunction printer into your network, or looking to connect corporate offices or provide secure VPN connections for telecommuters, Sage can help. Is your network secure from intruders - both internal and external? Are your employee's Internet habits costing you money by introducing viruses and affecting productivity? Sage Business Systems can help you limit your exposure and keep your valuable data safe. Whether you want to implement a new secure way of doing business, or you are having doubts about your existing plan, we can provide a solution for you. We create web based software solutions that enable companies to make more money while spending less. We listen to the needs and problems of businesses and help identify areas for the best return on investment. 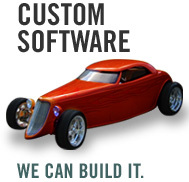 Our customized web based software solutions and Web components help meet your business needs.